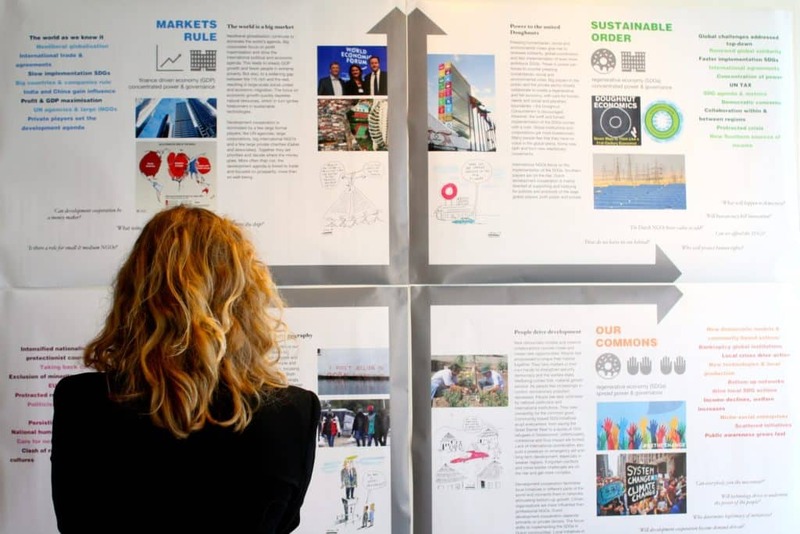 To be(come) resilient and adequately flexible towards the future, Partos – the Dutch membership organisation for development cooperation – initiated a transformative scenario planning process. Together with a cross-section of players in sector, we explored ways in which the future might develop as well as ‘A future we want’. The result: four vivid descriptions of plausible futures and ways in which actors in development cooperation in the Netherlands can prepare themselves for these futures. But also, an inspiring vision of a desirable future. A future that invites the sector to go beyond a reactive approach and that describes how Dutch development cooperation can transform towards a regenerative future. Perspectivity designed and guided the entire process in close collaboration with a core team and in 4 consecutive workshops with a large explorers group from the sector. After exploring relevant trends, we identified two major uncertainties critical to the future of Dutch development cooperation: power & governance and socio-economic development. Will the world remain predominantly market-driven, with financial growth (GDP) as the main indicator of success? 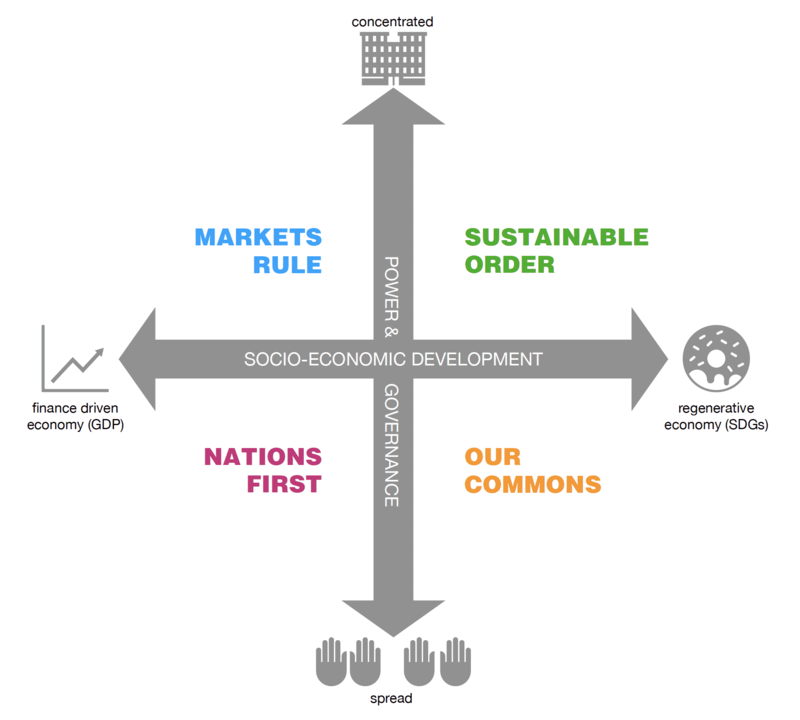 Or will we shift towards an inclusive and regenerative economy, taking into account the needs of people as well as social and planetary boundaries? A world in multilateral institutions, including the UN, and international mechanisms foster global coordination and fast implementation of even more ambitious SDGs. Big and small players join forces to counter inequality and climate change. Diverse multi-stakeholder coalitions collaborate to create a regenerative and fair economy. This future exploration has been a highly interactive and collaborative effort. The process started in November 2017 with 100+ anonymous professionals in Dutch development cooperation sharing a forecasting experience. They shared their story through Sprockler, an online story-based research method, which allowed us to distil relevant trends and uncertainties gathered in the Story of stories. 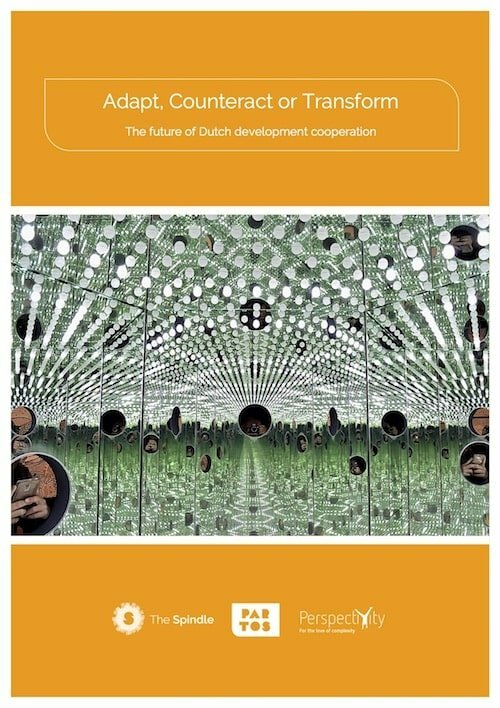 ‘Adapt, Counteract or Transform (ACT); The future of Dutch development cooperation’ is a publication under auspices of Partos and its innovation platform The Spindle, in close collaboration with Perspectivity. Partos is the Dutch membership body for organisations working in development cooperation. Perspectivity is a collective of facilitators for transformative change in complex settings.